My voice teacher in grad school would always say that unlike instrumentalists, singers are not able to objectively look at our instrument. So the development of our imagination is crucial to how we “play” it. If your goal is to play your instrument to it’s potential, then opening your imagination to conceive of your singing technique in new and different ways is essential. Today I’ve got a new image for you that will stabilize your breath support. If you are a singer who has ever struggled to get through a long phrase. . . . If you are a singer who has ever experienced tension and strain as pitch rises. . . . If you are a singer who has ever struggled with stamina. . . .
You just need some better tools to stabilize your breath support. I bring you this image courtesy of two of the great vocalists of the last century. Thomas Hampson, one of the great baritone voices of the last 50yrs, and Richard Miller, a vocal pedagogy pioneer, voice teacher (at my alma mater) and author of the seminal book on singing technique “The Structure Of Singing”. Both Hampson and Miller play with the same image when it comes to breath support in a phrase. 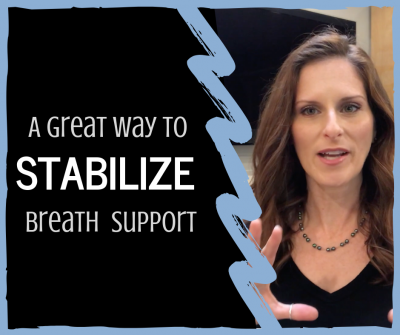 Here’s a video explaining how the idea of singing on the “gesture of inhalation” works to stabilize your breath support and showing you how to do it.